We have become too dependent on technology and what we really need it to unplug. Janelle, Kyle, and Dean were debating on the agree side and debating against them on the disagree side was Tayler, Nicole and Angela. Both sides did a fantastic job presenting their ideas to the class. Tayler discussed in her blog post that she was hoping to argue the agree side on this debate because she felt more comfortable with the topic. She made many great points throughout her blog and the one statement that stood out to me was, “I think I learned more than I ever could by arguing the opposite side of my initial beliefs.” I think this shows that we need to take the time to look at topics through a new lens to allow us to gain new perspectives. Personally going into the topic I was leaning towards the disagree side, but I wanted to be fair and listen to both sides to help me make my decision easier. When talking to friends about this topic many of them believed that we need to unplug especially our youth. The agree side presented many articles that explained why society needs to begin to unplug. There has been a huge movement that tells everyone how they need to unplug. 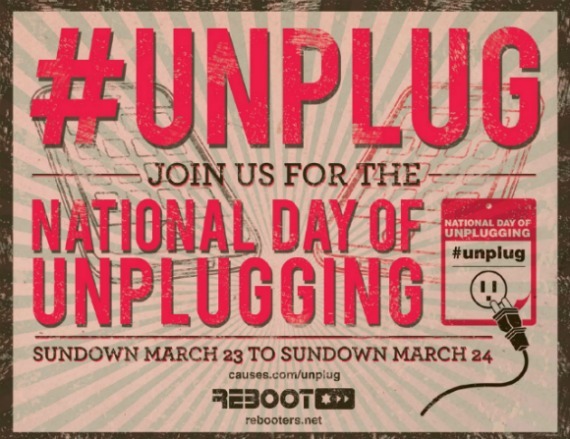 When I was reading Kelsie’s blog she mentioned her discovery about National Day of Unplugging and that was a huge surprise to me. 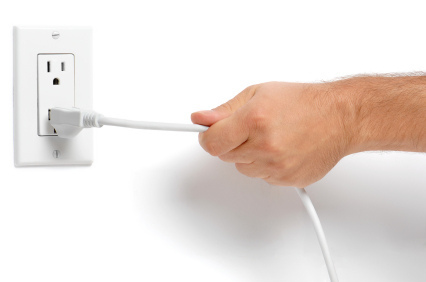 I agree with Kelsie that “It’s an interesting concept: connectiveness has become such a ubiquitous thing that we need a day specifically set aside to justify unplugging.” In the chat on Tuesday she asked, “What includes “unplugging”? Just devices? Laptops included?” When I think of this “National Day of Unplugging” I also ask myself the same questions. 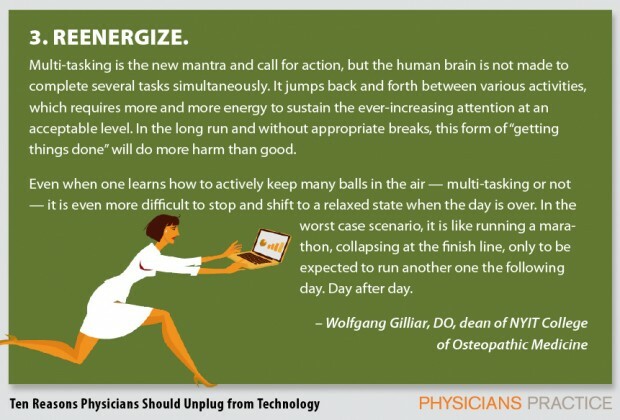 What does unplugging look like? I am allowed to use my stove or microwave to make supper? 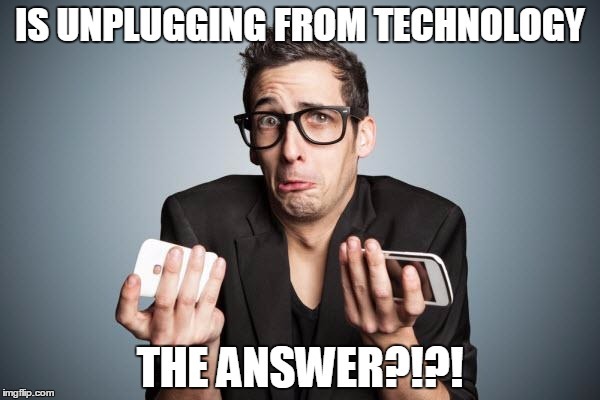 Are these types of technology included in unplugging? I took EC&I814 Critical Perspectives on Preschool Education in the winter and was lucky to get into the summer early learning institute where I took EC&I811 Current Issues & Research in Early Childhood Education and EC&I813 Play & Learning. In a Ted Talk Mary Beth Minton talked about the importance of unstructured play for kids and the need to make sure children unplug. From taking those classes from Patrick Lewis and Karen Wallace taught me about how children need to experience play in all of the different forms. I know when Damon and I start our family we want to make sure our children go outside to play and have the opportunity to experience different types of play. During the class we were able to explore and experience play and art while we were learning about the topics in our syllabus. I felt so calm after each class was over! I was able to connect and have great conversations with others while we were playing and creating art. I am not going to say that when Damon and I have children that they will not watch movies or television, but we will not let our children interact with technology for seven hours each day as discussed in the Ted Talk. *Digital etiquette: electronic standards of conduct or procedure. *Digital Health & Wellness: physical and psychological well-being in a digital technology world. The end of the video he talked about how he does not want to ruin special moments with a phone by taking videos, photos, or selfies. Is technology ruining special moments? This reminded me of a video that I discussed in my “Selfie Sticks! Get Your Selfie Stick” post from EC&I832. The idea of technology ruining special moments also connects to another video called I Forgot My Phone. Have we become to dependent on technology, especially our cell phones? The agree side shared an article with us written by Margie Warrell called Text or Talk: Is Technology Making You Lonely? In the article it discussed how “Social media allows us to control what we share” and “We can pick and choose which photos we share and craftily edit our words to ensure we convey the image we want others to see.” Are we representing ourselves in a way that truly reflects who we are? In the article it lists different ways to build a social network away from using technology. 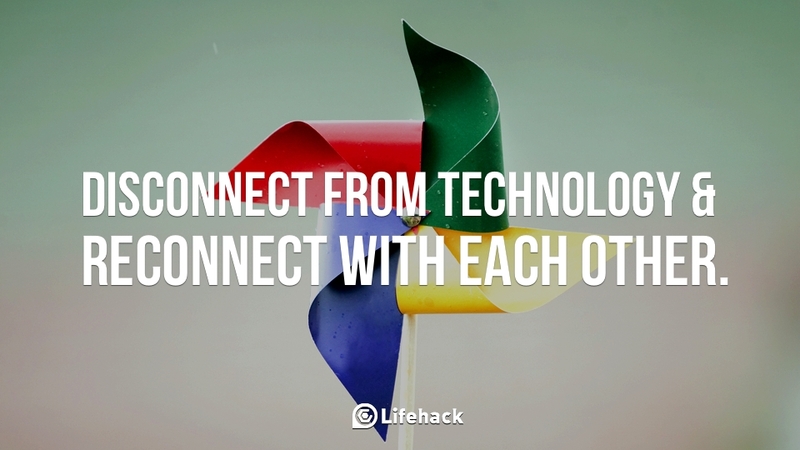 I am not 100% sold on the idea that if I disconnect from technology that I will reconnect with others. If I was to follow the words on the image above I WOULD NOT reconnect with my family! I use technology ALL THE TIME TO CONNECT WITH MY FAMILY! I call my family on a regular biases and often we use Facetime so we are able to see each other. I absolutely love this advertisement because it showcases how Facetime has truly helped me feel better about living away from my family. I am the only person in my family who does not live where I was raised so it is nice to be able to Facetime with my family when I am not able to make it to special events that happen during the week. My nephew and I have so much fun when we Facetime each other. He tells me about play school, what they did during the day, and shows me all the new things that he has learned. I love watching my ten month old niece and her reactions when my sister turns the phone to her so I can say hi. Her expressions on her face is priceless! She explores how “the Day of Unplugging is such a strange thing” and that “Those who unplug have every intention of plugging back in.” I found the comment about “leaving Facebook for a while to be in the world” very interesting because so many people do not realize that the “online world” and “offline world” are connected to each other. This relates to what I learned about digital dualism and augmented reality in EC&I832. I would never go online and state that I am leaving the online world and going on a digital detox. I am grateful for technology especially on a day like today! My husband works with Saskpower and this weekend with all of the storms he has been very busy trouble shooting different outages so he can get the power turned back on. I appreciate technology because he can update me if he is going to be home late through a quick text message and let me know he is safe in between jobs. I can even download different apps onto my phone to help relieve stress and anxiety. These types of apps can help me reconnect to myself! There are so many positive to technology! I am very excited to reenergize this summer as my brain feels like I have been running a marathon! Shannon and so many fellow classmates have discussed the importance of balance and moderation. 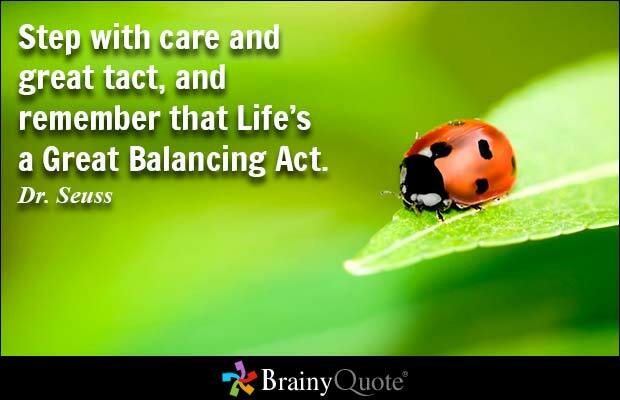 I believe life is about balance and moderation, but I also believe that it just takes time find the correct balance for yourself. My balance and moderation for technology might look different than yours, but that is okay. Everyone has different needs and personalities so we need to stop judging each other. I thought Luke included an excellent quote in his post that connects to my thoughts on this topic of unplugging. 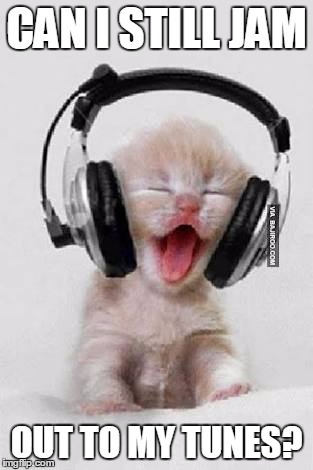 The quote written by Anne Lamott states “Almost everything will work again if you unplug for a few minutes…Including you!” I believe this quote also connects very well to my philosophy! 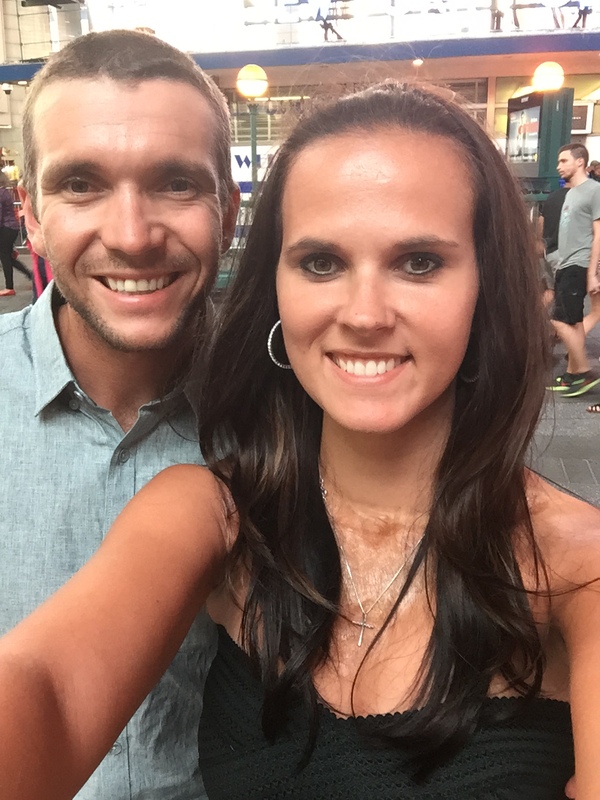 I thought Angela stated it best in her post that “…being connected in a balanced way enhances our realities and gives us opportunities to become our “best selves.” I could relate to Nicole’s post because I am also ready to take a step back from technology for the summer. I have enjoyed every class so much as each class has helped shape my teaching practices and philosophy. I have not taken a break from classes since summer of 2014 so I need to unplug for a few minutes to recharge and get ready to work again for my new grade two class in the fall. Does that mean that I will not turn on my computer to do planning over the summer? Or that I will not log into Facebook or Twitter all summer long? Absolutely not! One of the ways that I recharge and reenergize is by being connected to my family and friends! I am looking forward to have more time to spend with my husband and not having to be so connected to technology to get my assignments complete and marking entered. I want to thank my husband Damon for being so supportive while I was taken classes towards getting my Masters Curriculum and Instruction. I am so grateful to have him in my life and that he was able to pick up the slack in the areas that I was not able to do as much at home, especially the semesters that I had to drive to Regina!